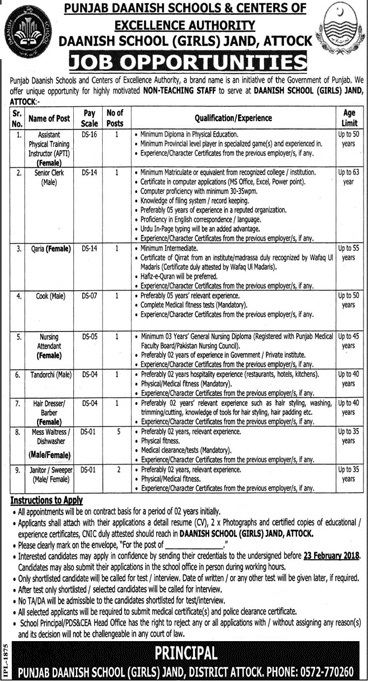 Punjab Daanish School & Center of Excellence Authority (GIRLS) Jand, District Attock has announced 14 New Jobs in Daily Jang Newspaper. Candidates who meet the said Criteria may apply for Punjab Daanish Schools Jobs 2018 for following Titles, Assistant Physical Training Instructor, Senior Clerk, Qaria, Cook, Nursing Attendant, Tandorchi, Hair Dresser, Mess Waiters and Sweeper. All Appointments will be on Contract basis for a period of 02 Years initially.